I’ve been away for a while, working on a book. Finished yesterday-hooray! Now that I am finished and have rejoined the living :-), I am making a commitment, right here in writing, to bring you a blog three to four times a week. I expect you to hold me to it. I welcome comments. Your comment automatically enters you in a monthly drawing for a free, autographed copy of an Ann Roth book! This morning while I enjoyed my Sunday-morning bubble bath and listened to the Sunday puzzle on NPR, Will Shortz, the New York Times puzzle editor, reviewed last week’s challenge: “Take the brand name of a popular grocery item, push two consecutive letters together without otherwise changing the name in any way, and the result will be a make of car.” The answer: Mazola. Push the o and l together and get Mazda. Clever, isn’t it? I sure didn’t figure it out. Which got me thinking. How often do I think outside the box? Sure, I can develop fictitious towns, come up with interesting plots and create memorable characters, but is that actually thinking outside the box? I don’t think so. 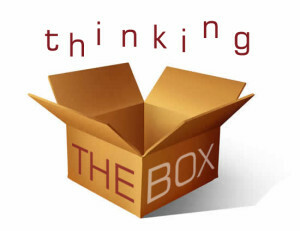 My challenge for the coming week: Think outside the box. Turn “what-if” on its head and look at life from angles I’ve never even considered. I’ll report back. I’d love to hear suggestions on how to think outside the box. What do you do?